"Barton Fink," the fourth film by the Coen brothers is a bizarre homage to Hollywood's studio system. This tale of a socialist playwright adrift in Hollywood circa 1941 is shows what would have happened if the movie "Sullivan's Travels" had been set in hell. 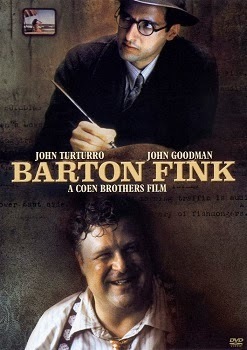 "Barton Fink" was the first film to win all major awards at the Cannes Film Festival. It was also nominated for four Oscars. Barton Fink (John Turturro) is the rave of Broadway. His new play is a huge critical success. Barton wants to create theater for the People about the People! Barton believes in the dramatic possibilities found in the ordinary life of the common man. He is a naive elitist with an attitude. On opening night, Barton's agent gives him offer to write for the movies. Barton doesn't want to sell out, but his manager finally convinces him that the money he will earn could be used to finance future plays. Once in LA, Barton meets Mr. Lipnick (Michael Learner in an Oscar nominated performance) the head of Capital Pictures. Barton is set to work on a wrestling picture, which will star Wallace Beery. If ever there were a subject that involved the common man, wrestling would be it. Barton can't write more than a few words. Barton also crossed paths with a drunken William Faulkner type named W.P. Mayhew (John Mahoney) and his enabling secretary (Judy Davis). Barton's closest link to the common man is his neighbor in the next room, Charlie (John Goodman). Charlie is a hulking but likable insurance salesman. Charlie has a ton of stories about the life of the common man. Barton is to busy running his mouth to take advantage of them. This could be dangerous in the long run. The Coen brothers build a very strange universe with these characters. In many ways, "Barton Fink" is the Coen brothers' least accessible film. Movie buffs will obviously enjoy the movie. Others may be put off by the lead character's obnoxious personality. I personally wished that the worst would happen to Barton just to shut up his pompous ravings. "Barton Fink" is biting comedy at its darkest. There are no normal characters in this film. Perhaps the message is that the 'common man' Barton Fink is always speaking of doesn't exist. In Preston Sturges's "Sullivan's Travels" a filmmaker played by Joel MaCrea wants to make movies of social significance. He goes on the road only to discover that the common man in depression torn America appreciates simple comedies to help them escape their troubles. Sullivan had to get his finger on the pulse of society. Unlike Sullivan, Barton is a studio outsider who thinks he is in touch with the common man. He soon finds out that life is not what it seems. Barton resides in a small hotel room with no air conditioning. The green wallpaper constantly peels from the walls due to the heat. The wall below is a red mass, which resembles a skinned human being. The glue, which runs down the walls, resembles seminal fluids. Barton constantly tries to keep the wallpaper from peeling. In someways it represents his idea of the how the world is ordered. The flesh and blood below is alien to Barton. He exists on a mental plane, oblivious to the ways of the flesh. Charlie will teach him otherwise. "Look upon me! I'll show you the life of the mind!" Excellent but strange movie. Great picture and sound. So-so extras. Excellent transfer. No pixilation. Deep, well saturated colors. Great detail in the dark scenes. Ditto for the soundtrack. The movie is filled with mystery. There are many scenes involving sounds seeping through the walls of Barton's apartment. The subtle audio track is excellent. The viewer is teased by words and sounds just beyond the field of comprehension. There are 8 deleted scenes. They are more like deleted lines. Each scene involves one or two lines of dialogue cut from existing scenes. The only one which added anything to the storyline was the scene in which Peter Mayhew acknowledges knowing who Barton was when they first meet. The other extras include a small photo gallery and trailers for the Coen brother's first three films. A must have DVD. It is a shame that the DVD didn't include a commentary track. If ever a film deserved or needed one it is "Barton Fink."